Simon Gerrans has turned his fortunes around winning the third stage of the Tour Down Under to take the leader’s jersey at the mid-point of the race. Gerrans (Orica-GreenEdge) won a reduced group sprint from defending champion Rohan Dennis (BMC) and Michael Woods (Cannondale) on what was a decisive day for the general classification with Team Sky now set to adjust its focus. Gerrans suffered minor skin abrasions in a late crash that prevented him from sprinting for line honours yesterday, though showed no sign of weakness today as the front group hit speeds in excess of 100km/h in the descent to the finish line. “To have a mishap so close to the finish when I was feeling so good was bitterly disappointing for myself and the entire team, so to come away 24 hours later with the win and now the lead I think everyone will be really happy tonight,” the 35-year-old said. The Corkscrew climb within the final 10km of the 139km run from Glenelg to Campbelltown as anticipated separated the best ascenders from the rest. Teams fought for position leading into the base of the climb with Tinkoff and Sky sitting at the front of the peloton. 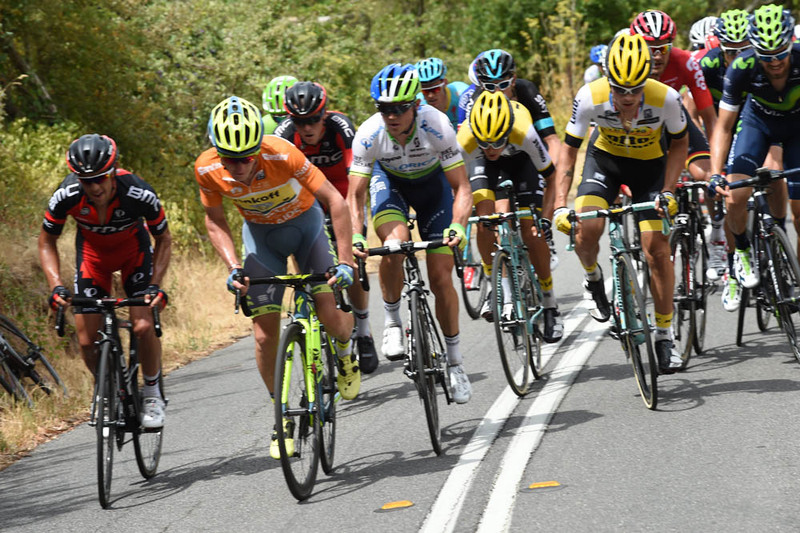 An elite group including Gerrans, Woods, Dennis and BMC team-mate Richie Porte, overnight race leader Jay McCarthy (Tinkoff), Sky’s Sergio Henao, and others, formed on the climb where the attacks started. 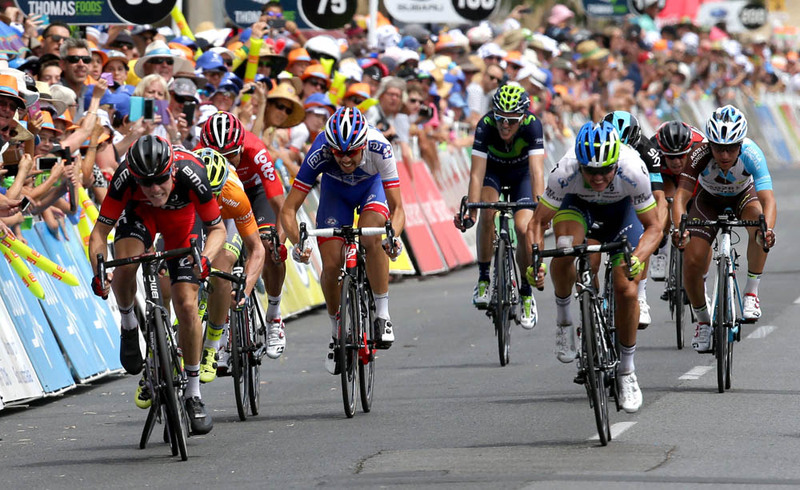 Porte came to front with Gerrans on his wheel before Henao then attacked with Woods but could not stay away. Geraint Thomas did not make the selection and Sky will now put its weight behind the Colombian, who sits fifth overall and 15 seconds in arrears of Gerrans with Willunga yet to come. “He didn’t have quite the legs he was hoping for,” Sky sports director Kurt Arvesen said of Thomas. “They were both leaders, protected into today, and we wanted to see how they ran, even Pete [Kennaugh] had a free role to see where he was. Belgian Laurens de Vreese (Astana) attacked from the start of the race and marked a maximum time advantage of around four minutes, as Tinkoff controlled the pace of the peloton, before being inevitably caught with about 20km remaining. Tyler Farrar (Dimension Data) and Marcus Burghardt (BMC) were among a small group that came down in high-speed crash on a descent soon after. Both walked gingerly around the team buses after the race but did not appear to be seriously injured. Sprinters and opportunists will have another shot at victory tomorrow with stage four from Norwood to Victor Harbor.